I do not read the Nihon Keizai Shimbun's editorials as often as I should. I am glad though, that I read the editorial the paper published on July 15 on the results of the gubernatorial election for Shiga Prefecture. I am clearly not alone in seeing an emerging recidivism in Abe's and the Liberal Democratic Party's rhetoric-- like the plan to revive the economies of declining prefectures by making it easier for for small- and medium-sized businesses to win government procurement orders (I am not making this up - Link). It has been exactly one year since the end of the so-called "Twisted Diet" of two opposing parties, one controlling the House of Representatives and the other the House of Councillors. What has come about was an easy-to-understand failure coming at a time when the gradual trend seems to be the reappearance of the LDP of old. It would be good [for the party members] to remember their zeal during their time in opposition. The paper goes on to warn that if the Abe Cabinet, after Abe names his new State Minister for Rural Revitalization in the presumed September cabinet reshuffle, goes on to promote shallow reforms with a target of capturing local votes, then it should not expect its weakened support ratings (Link) to start climbing any time soon. A warning worth listening to, when it comes from the editors of Japan's top business news daily, the voice, they say, of the Establishment. 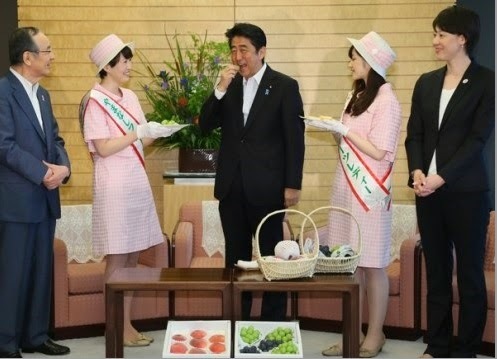 Image: "The Prime Minister Receives a Courtesy Call from Members of a PR Campaign for Yamanashi Fruits"